Simsbury, CT - The Simsbury Chamber of Commerce is hosting its first ever Public Art Trail this summer. The project, which started on May 15th, features 32 bronze sculptures, and has drawn tens of thousands of visitors from all over the U. S. to Simsbury’s gardens and streets to catch an eye of these life-like figures. Visitors can always be seen along the Hopmeadow Street sidewalks, as they visit each one, often taking pictures alongside them. After three months of displaying the sculpture works of artist Seward Johnson, the Simsbury Public Art Trail will be hosting a “Sculpture Look-Alike Photo Contest” from now through the art trail’s closing date of October 27, 2018. 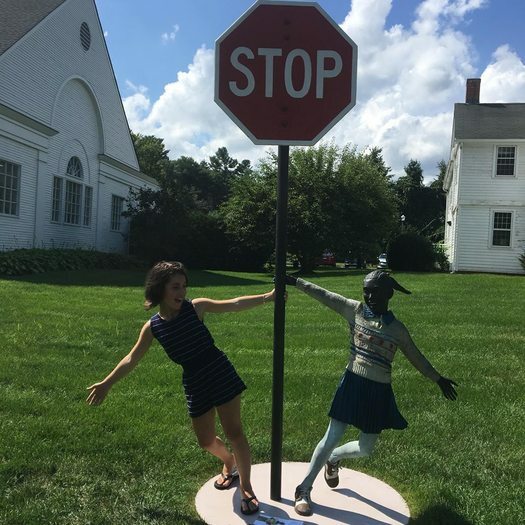 Pose alongside your favorite sculpture or snap a selfie, and submit your best pictures to info@simsburycoc.org. The winner of the contest will be announced on the main stage at The Richman Chili Challenge on Saturday, October 27th. The winner will receive a $100 gift card to Fitzgerald’s Foods. The sculptures have been worked into the town’s landscape to echo everyday activities, and are meant to catch the eye and call attention to small pleasures and encounters. The initiative was originally scheduled to conclude on September 15th, but, after the incredible success and publicity generated around the display, it was extended until Saturday, October 27th. The six-week extension of the project did not come without drawbacks, including additional expenditures not originally anticipated. For this reason, the Simsbury Chamber is still working to acquire donations and sponsorships to cover the cost of the project. Individuals can make donations right on the project website, www.simsburyarttrail.com. For sponsorship information, contact Lisa Gray at info@simsburycoc.org or call (860) 651-7307.